Get a professional garbage disposal installation by Clovis Plumbing Services! Offer applies to the purchase and installation of a garbage disposal. If your old garbage disposal has finally broken down, a new garbage disposal installation is not hard providing youve got the correct materials and tools. Ensure you've got the correct kind of plumbing disposal and then adhere to the following instructions to get your disposal functioning immediately. Determine the type of disposal you want. There are some factors that must be taken into consideration when you go searching for a new garbage disposal. Consider the people that will be making use of the disposal, whether getting a loud disposal in your home will be a problem or not and the type of plumbing you've got in your house. If little kids will be making use of the disposal, think about acquiring a batch feed disposal instead of a continuous feed disposal. Although batch feed disposals are a little more costly to acquire, they need the use of a stopper before they operate, which makes it safer in homes where there are children. On the other hand, continuous feed disposals begin to function as soon as you turn on a switch and continue to run even after switching it off. If anybody mistakenly sticks their hand inside or drops a utensil down the drain, this can prove extremely dangerous. Select a motor that is appropriate for your home. Lower horsepower models, typically around 1/3, are best suited for small homes with a little quantity of food waste. Bigger homes with more food waste are better served with 1/2 horsepower models. Think about the desirable features you would like in the disposal. You can purchase one built from stainless steel, a quieter disposal, or one that can be connected to your dishwasher for a higher amount. Switch off the power. Ensure that the power is off during the garbage disposal installation. Also, make sure that the panel box is covered so nobody will be able to switch it back on pending job completion. Disconnect the hose of the dishwasher. It isn't all disposals that are attached to a dishwasher, however, if your own is, make use of a screwdriver to undo and remove the hose that connects the disposal to your dishwasher. Disengage the waste line. 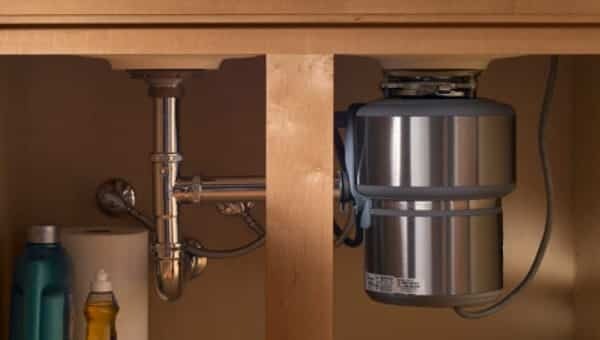 With the use of a wrench, get rid of the trap waste line that runs from the disposal by unscrewing the slip-nut that connects the disposal to the trap. It is advisable you put a bucket underneath the trap in order to hold any wastewater remaining at the bottom. Remove the disposal. To take away the disposal, insert a screwdriver into the mounting ring lug and turn anticlockwise pending when it loosens. Dismantle the remaining mounting assembly. Take out the ring on the fiber gasket, the sink sleeve, the flange and the plumber’s putty. Cleaning the sink opening, sleeve and flange complete the preparation process of the sink for the new disposal. Wiring of the new disposal. There are some disposals that come with already attached appliance wires while some don’t. If your disposal does not, take away the cover plate under the disposal and fix the wires as instructed by the manufacturer. The typical garbage disposal installation instructs you to attach black wires to black wires and white wires to white wires. After you are done with that, screw the cover plate back on. Drain flange installation and ring mounting. To shape a snake about 10 inches (25.4 cm) long and 1/2-inch thick, roll plumber’s putty between your hands. Rub it at the bottom of the drain flange beneath the sink. Put in the flange into the hole of the drain and push down consistently to connect it. After that, snap the fiber gasket, backup ring and mounting ring on. Go under the sink and make use of a screwdriver to screw the mounting ring firmly against the sink. Alternating sides will be very helpful, screwing on a screw and turning to the other, thus consistently tightening the mounting ring. Expect to see some of the plumber’s putty squeezed out around the flange. Trim it away with the use of a knife. Mounting of the disposal. Put the disposal into the mounting ring, ensuring that the outlet of the disposal is exactly opposite the connection to the drain pipe. Make it tighter until the disposal is intact. Attach the disposal to the P-trap. Take the measurement of the discharge pipe and cut it to size using a hacksaw, after that connect it to the disposal's outlet. Make sure you study the manufacturer’s instructions so that you can properly connect it. In addition, attach the dishwater discharge tube. Test the garbage disposal installation. Switch on the power back, allow water run into the sink and switch on the disposal to confirm it is working. Verify that there are no leaks underneath. Ensure that the disposal is functioning properly by running some food through it to confirm that it grinds and gets discarded correctly. Please visit our Five Quick Fixes page for DIY plumbing repairs.